Mortgage Application: Do You Have To Read EVERYTHING? A few years ago, the Mortgage Bankers Association released a statement claiming the average mortgage application file contains over 500 pages! However, this includes a standard application form, disclosures, and all the supporting documents. An appraisal, purchase contract, credit report, title search and tax returns could potentially make up hundreds of pages right there. But what you actually have to read and deal with is not that much. Here are the most important disclosures to consider when you complete a mortgage application. When you choose a mortgage and a lender, the Loan Estimate, or LE, is your best friend. It allows you to compare offers from lenders and choose the best deal. The LE replaced the old Good Faith Estimate and Truth-in-Lending (TIL) disclosures in late 2015. The LE is three pages long. Page 1 contains the most important loan features, front and center. This includes your loan interest rate and term, estimated payment, and lock expiration. 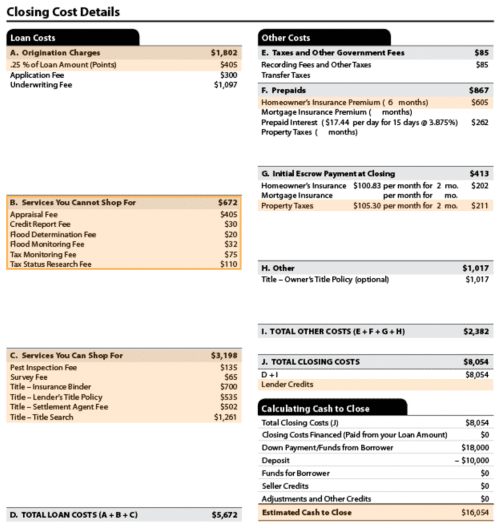 At the bottom of Page 1, you’ll find the loan’s total closing costs. Note that mortgage lenders are not obligated to provide you with a Loan Estimate when you’re just shopping. They only have to issue it withing three business days of you completing a mortgage application. That said, the LE offers consumers protections and obligates lenders in a way that a simple “worksheet” or “scenario” does not. Ask lenders for this form. And remember, they are competing for your business. Note that once you have a loan in process, your lender may issue you a new LE if there is any “material change” in your application. For instance, if you switch loan programs or lock in an interest rate. Page 2 of the LE gets into more detail. As you go through your loan charges, make sure they’re what you expected. Are you paying discount points? 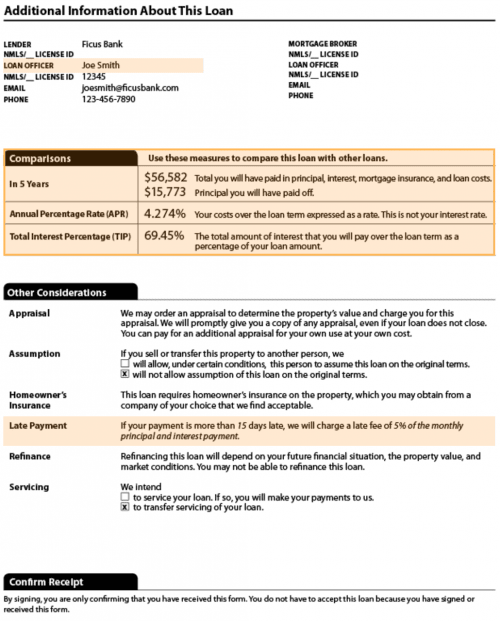 How do the costs for items you can’t shop for (like the appraisal) compare to other lenders? How do the lender charges compare to other offers? Are you getting a lender credit to cover some of the costs? Note the items that you are able to shop for, and decide if you want to look for lower-cost providers. The last page of your LE provides the loan’s APR, which used to be disclosed on a TIL form. APR includes the interest you pay as well as your loan costs. It’s expressed as an interest rate to make comparing different loans easier. How else would you know what’s cheaper – a loan with a 4.00 percent rate with a one percent origination fee, or a 3.75 percent loan with a one percent origination fee plus two percent in discount points? In this case, the first loan has an APR of 4.083 percent, while the second loan’s APR is 3.993 percent. If you plan to keep your loan for its entire 30-year term, the second loan is cheaper. However, it also requires a large upfront investment that will only pay off if you don’t sell or refinance within a few years. Given that these APRs are fairly close, it’s probably safer in this case to choose the loan with lower upfront costs. The main thing is that you use this number to make valid comparisons and know what you’re getting into. The standard Fannie Mae Form 1003 is used for almost every type of mortgage financing. And guess what? It’s only four pages long (five if you count the blank one at the end). At least three business days before you close on your home purchase or refinance, you get a final document called a Closing Disclosure, or CD. It’s five exciting pages that you should review carefully before committing to your loan in writing. Verify that the loan amount, interest rate, monthly payment and other terms match the last Loan Estimate you received. Verify that your closing costs match those in your last LE. Double check that the costs for items you were able to shop for are as expected. Verify that you received any credits from the lender or seller that you are entitled to. Check for loan features like prepayment penalties or balloon payments. The nice thing about reviewing this stuff before you’re at the closing table is that it removes pressure. If you have questions, give your lender a call. Chances are you can sort out any errors or misunderstandings easily enough. Your lender may need to redraw the documents if there are any mistakes, and you’ll get a new set of disclosures. Today’s mortgage rates can vary widely between lenders, so it really matters if you shop. 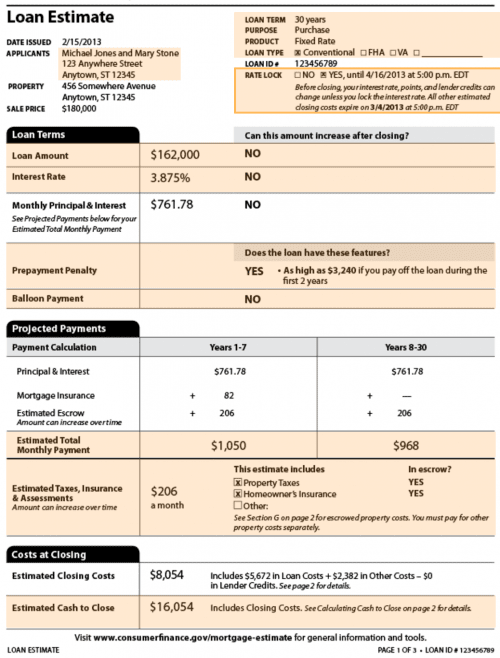 Get your LEs from several competing lenders and do a little comparison shopping. It could save you thousands.